Looking for rent a Bobcat E85 Mini-Excavator in Rochester NY, Ithaca NY and Western New York? The Duke Company is proud to feature Bobcat Mini Excavator Rental equipment. 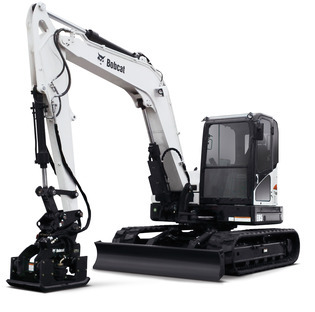 Largest mini-excavator manufactured by Bobcat. Exceptionally fast cycle times for difficult jobs. Fully adjustable, super deluxe seat. Load sensing technology, resulting in smooth control. Engine Emissions: Interim Tier 4. Maximum RPM (Governed): 2,100 RPM. Operating weight = 18,960 pounds. Travel Speed at Maximum = 2.9 miles per hour. Travel Speed at Minimum = 1.7 miles per hour. Arm digging force = 8,069 pounds. Bucket digging force = 14,509 pounds. LIft capacity (rated) = 9,327 pounds. Digging depth at maximum = 15.5 feet. Dump height at maximum = 16.5 feet. Reach maximum at ground level = 23.9 feet.